A pull-down menu is not the ideal solution for global gateways. For starters, it doesn’t scale well. If you offer ten or fewer country Web sites, a pull-down menu might work okay, but anything beyond that and you’re asking a number of users to do a bit of scrolling. The scrolling issue becomes particularly apparent when a menu includes 100+ countries. which is often the case on “select your country” input forms. Sorted alphabetically, countries like the US and UK are going to fall near the bottom of this list. Which is why some organizations bump these countries to the top of the list. This is an unfortunate solution, as it tells the rest of the world that a specific country is more important than the others. 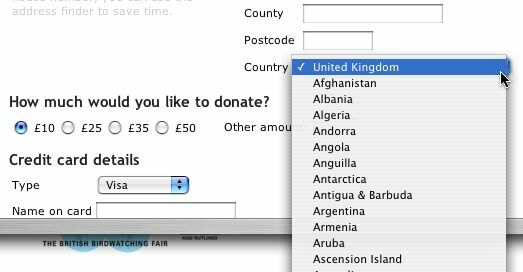 I recently visited a non-profit organization in the UK and had to select my country. Sure enough, the UK was at the top of the list while I had to do a bit of scrolling to find my country. So what’s the alternative? Geolocation is one approach — in which you guesstimate the user’s country — an approach that is roughly 95% successful. You can also present a pop-up map with countries grouped by region so the user can quickly select his or her country. If you must use a pull-down menu, just don’t play favorites.